Frontline Aerospace introduced their SkyFan cleansheet business jet at the corporate jet investors conference in London in January 2019. The press release includes quotes from several leading experts in aircraft design and implementation. SKyfan doubles the range of a business jet and delivers fuel economy at a $1/ nautical mile for 8 passengers. Frontline Aerospace’s Cnetriptial compressor patent was published by the USPTO. It’s critical value in gas turbine compression is improved specific power and fuel savings. It works by removing heat from the compression process thereby reducing the energy and work required to compress the air. This patent application is for improving the system efficiency of parabolic trough collector fields. It works by capturing stray light that would have missed the collector tube due to plant age, array settling and misalignment. Overall the SkyCon product retrofit can improve plant efficiency byt 2-3%. 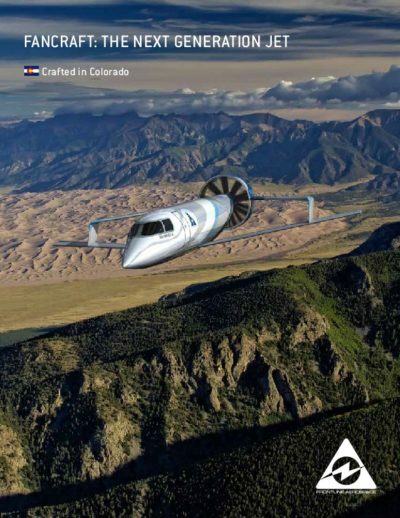 Broomfield, Colorado, July 17, 2012 – Today the USPTO granted a patent to Frontline Aerospace for a Vertical Take-Off and Landing (VTOL) aerial vehicle (US 822,0737 B2). “The future of VTOL aircraft is what is called fancraft rather than rotorcraft, as seen in films like Avatar and The Avengers,” said Frontline CEO Ryan S. Wood.